The Japan America Society of Southern California grew out of the need for a group in which both Japanese and Americans could meet socially on common ground. In the ensuing one hundred years, it has developed to meet the challenges of changing times. The Japan Society was established in New York City in the spring of 1907. 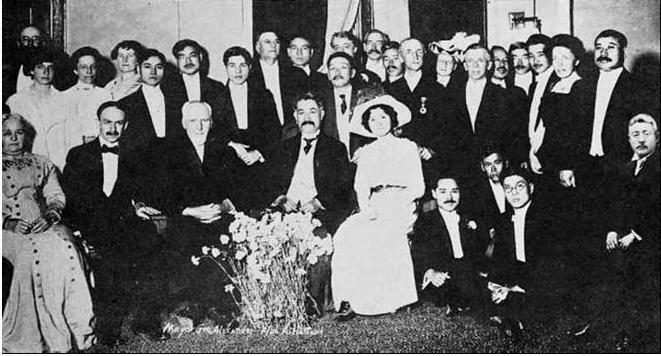 Inspired by that development, a group of Japanese and American friends in Los Angeles met in October of the following year at the home of the Reverend and Mrs. Charles C. Pierce, where they discussed the establishment of a similar organization in Southern California. There were sixteen people at this planning meeting, which was considered a good omen, seeing that there are sixteen petals in the Imperial chrysanthemum. On February 21, 1909, the Society was officially launched at a banquet held in the Y.M.C.A. building in downtown Los Angeles. Some eighty Americans and Japanese attended. The organization was named the Japanese-American Fraternity and the motto “Mutual Friendship - Mutual Harmony” was adopted. Dr. Harvey Hugo Guy, a noted scholar and Superintendent of Japanese missions in California, was elected president. No Japanese Consulate then existed in Los Angeles, but Japanese immigrants and their families had banded together on a number of associations. They constituted a minority, which, in spite of the hard work and admirable traits of its members, often suffered from discriminatory practices. The majority was excluded from the social life of the community at large, and Japanese visitors were normally limited to meeting only their own countrymen. The Society helped to alleviate some of these problems. Original membership of the Society was comprised of Christian missionaries who had served in Japan, educators, Japanese business and professional men, a few Japanese students, and several prominent American businessmen. From the beginning, a third to a half of the members were either Japanese or of Japanese descent. A major task at first was the entertainment of Japanese visitors to Los Angeles. A Trade Mission of fifty members headed by Baron Eiichi Shibusawa was welcomed in the first years of the Society. From then on, the Society and its members hosted a succession of missionaries, academics, parliamentary missions, and government officials. Full JASSC history is available for download "The First 100". 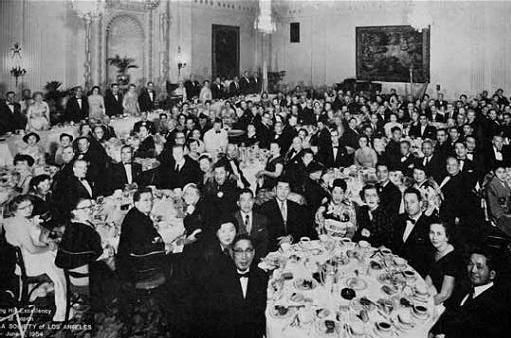 Banquet honoring His Excellency Sadao Iguchi, Ambassador of Japan to the U.S., June 3, 1954.